Beach Destiny captures that feeling when you first see the ocean. You can remember the feel of the sand between your feet as you smell and hear the beach. This reproduction has mirror imaged sides. Order hand embellished, signed and varnished prints on gallery wrapped canvas (.75″-1″ deep). Allow 3 weeks for delivery, though some giclees will deliver in 1-2 weeks. Contact me prior to order with questions. Every image is a unique design created by Karen Ahuja. 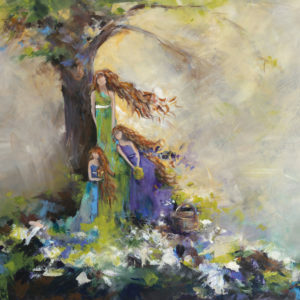 Order a Karen Ahuja Studio original painting on a gallery wrapped canvas. Each image is a unique design that has been varnished and signed by the artist. Order this 16 x 16 pillowcase (no insert). Using high-tech photo printing, this image is printed on a soft satin pillowcase. The back of the pillow is white. If the original image is rectangular, the image will be cropped on the square pillow with the focal point as the center. Prints 16×20” and smaller ship flat in a rigid mailer. Paintings 40×40” – 36×48” and smaller will ship stretched and ready to hang. Paintings 48” x 48” and larger will be taken off stretchers and rolled for shipping. I can ship directly to a local framer who can re-stretch the canvas on stretcher bars for a fee. This is much less expensive than shipping stretched and is safer for the painting. *LOCAL:* If you’re local to the Northwest Arkansas area and would like to pick up at my studio, feel free to contact me.